JOHANNESBURG (AP) — The captain of South Africa’s national soccer team was fatally shot at a friend’s house during an attempted robbery on Sunday night, police said. Goalkeeper Senzo Meyiwa was killed around 8 p.m. after two gunmen entered a house in Vosloorus township near Johannesburg while an accomplice waited outside. The 27-year-old Meyiwa was shot in the upper body, police spokesman Brig. Neville Malila said Monday. Malila didn’t comment on local media reports that he was shot in the back trying to protect his girlfriend. The three assailants then fled on foot, according to the police service, which offered a reward of nearly $14,000 for information leading to arrests in the case. Malila said investigators were treating the incident as an attempted robbery, and a murder investigation was underway. He said no arrests had yet been made and there had been seven people in the house before the two intruders entered. No one else was injured. Nothing was taken from the house, Malila said, but he couldn’t rule out that the gunmen had demanded cellphones, cash and other valuables from the occupants. South Africa has a high rate of violent crime, an issue that was raised during the recent trial of Olympic runner Oscar Pistorius, who claimed he shot and killed his girlfriend by mistake during the night after mistaking her for a dangerous intruder in his home. Meyiwa played for South Africa’s hugely popular Orlando Pirates club and the police force said late Sunday on its Twitter account that it was breaking protocol to announce his death soon after the shooting. Police also called for calm, saying “upset” people had gathered at the house and at the hospital where Meyiwa was confirmed dead. “We can confirm that Bucs ‘keeper Senzo Meyiwa has been shot and sadly declared dead on arrival at hospital,” the police said, using the nickname for Meyiwa’s club. Police said he was shot after an “altercation” and the suspects ran away. South Africa’s national police commissioner Riah Phiyega was due to hold a media conference on the shooting later Monday as a manhunt for the suspects was launched. “This is a sad loss whichever way you look at it — to Senzo’s family, his extended family, Orlando Pirates and to the nation,” Orlando Pirates chairman Irvin Khoza said. 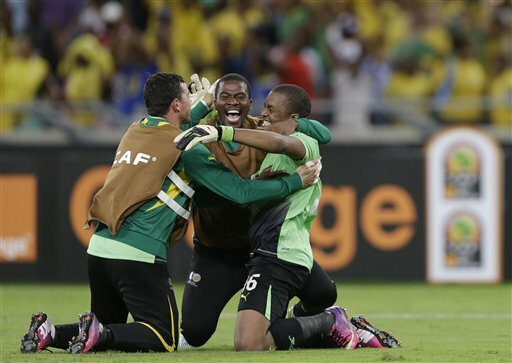 Meyiwa was recently made South Africa’s captain and led the team in four qualifiers for the African Cup of Nations this year, including its last game, a 0-0 draw with Republic of Congo on Oct. 15. He played for Orlando Pirates on Saturday in a 4-1 win over Ajax Cape Town in a cup competition. It’s the second death to hit South African sport in three days after former 800-meter world champion and Olympic silver medalist Mbulaeni Mulaudzi was killed in a car crash on Friday. “The law enforcement authorities must leave no stone unturned in finding his killers and bring them to justice,” Zuma said. Imray reported from Stellenbosch, South Africa.